Delivery Hero is selling its German business to rival Takeaway.com for 930 mln euros. As with Uber’s capitulation to Didi in China’s car-share wars, it means an end to cutthroat competition in another gig-economy market – and relief for both companies’ investors. 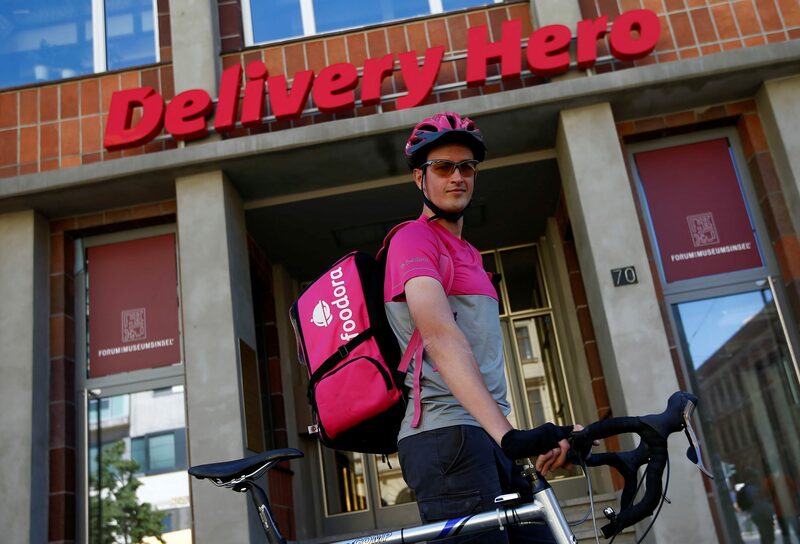 Andreas Harte, a Foodora delivery cyclist poses in front of Delivery Hero headquarters in Berlin, Germany, June 2, 2017. Delivery Hero agreed to sell its German food delivery operations to Dutch rival Takeaway.com for around 930 million euros, the companies said on Dec. 21. Takeaway.com will pay 508 million euros in cash and offer 9.5 million of its shares, or 18 percent of the Dutch group. The combined revenue of the two companies' German businesses was 136 million euros for the first nine months of 2018, they said. Takeaway.com said it expects total cost synergies from the deal to exceed 60 million euros by 2020. Takeaway.com said it had secured 680 million euros of bridge financing. Shares in Takeaway.com were up 24 percent at 0900 GMT on Dec. 21, while Delivery Hero shares rose 12 percent.